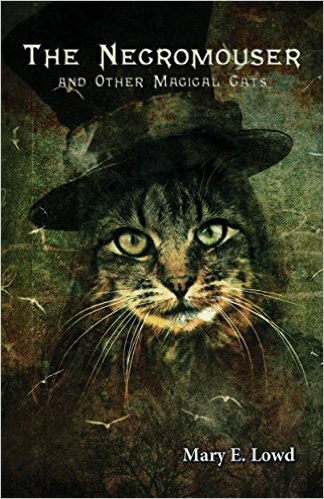 The Necromouser and Other Magical Cats, by Mary E. Lowd. Dallas, TX, FurPlanet Productions, September 2015, trade paperback $9.95 (131 pages), Kindle $6.99. This collection of 13 cat short stories by Mary E. Lowd contains nine reprints and four original tales. It also contains all of her popular “Shreddy” stories, including a new one written just for this collection; six in all. Shreddy is an overweight tabby housecat; one of three pets – the other two are Cooper, a moronic labradoodle, and Susie, an idiotic spaniel — of a Red-Haired Woman enamored of electrical devices that she doesn’t really understand. Shreddy would undoubtedly take exception to being called a “pet”. He is an independent individual who just happens to share a house with her and her brain-dead, slobbery dogs. He is constantly in a battle of wits with the Red-Haired Woman (which she doesn’t notice), using her electrical devices (that he doesn’t understand, either). Whether Shreddy is using the Red-Haired Woman’s printer to reanimate dead mice (“The Necromouser”), using her smartphone’s games to bring deceased mice (“‘Brains!’ they all squeaked back in chorus”) and neighborhood dogs back from the dead as zombies (“Shreddy and the Zomb-Dogs”), using a TV dish to hatch a griffin’s egg (“Shreddy and the Silver Egg”), dueling with Whisperquick, the ghost mouse (“Shreddy watched with eyes dilated like a kitten high on catnip, wondering whether the Red-Haired Woman and the dogs could see the ornaments constantly rearranging themselves. Surely the Red-Haired Woman must notice that one of her Santa ornaments was wearing six hats while five others went hatless?”) for control over a plastic-&-metal Christmas tree (“Shreddy and the Christmas Ghost”), inadvertently entering a PlayCube (“Shreddy and the Dancing Dragon”), or coming to an accommodation with a Venus flytrap with a sweet tooth (“Shreddy and the Carnivorous Plant”), Shreddy is always determined to defend his turf, even if it almost kills him. The six “Shreddy” stories fill slightly over the first half of this collection. The remaining seven, four reprints and three original, all quite short, are stand-alones. “Songs of Fish and Flowers” tells of Carly, a cat in a house of a witch who also grows enchanted roses. When the witch moves out, Carly and the roses are abandoned. This is a melancholy mood piece. “Katelynn the Mythic Mouser” is a companion story. Aunt Molly is a modern witch with a garden. When little Jenna stays with her, she learns magic. When Jenna has to return to her mundane parents’ home, she wants to bring Molly’s cat, Katelynn, with her. Magic provides a way. “Magtwilla and the Mouse” features a mother cat who is bereft of her kittens and finds something else to love. “Cold Tail and the Eyes” could be a companion piece to the above. Here, Gray Tail is one of the kittens, and he fights being separated from his mother. He fights and fights, and uses up his nine lives. He finally learns to stop fighting. Toby is delighted to get such a playmate. “In a Cat’s Eyes” contrasts Jason, an exuberant Collie puppy, and Myra, an aged Siamese cat. Jason has his whole future in front of him. But this is only one of Myra’s many, infinitely varied lives. This small book (cover by Roberto A. Sanchez) – it would be a short novella if it was a single story – presents one magical cat in six adventures, and seven others having an adventure apiece. Many of them are so short they are little more than mood pieces. But they are all delightful, like a box of rich mixed chocolates. They are probably best taken one or two at a time, and savored – unless you are a glutton for all of them at once.